The chicken: a hard and fast staple of America's barnyards. A person would be pressed to find a farmstead not housing a flock of elegant leghorns and energetic golden buffs, but it's increasingly common to see birds of a different feather sharing the coop: a muffed, pea-combed chicken called the Americana. 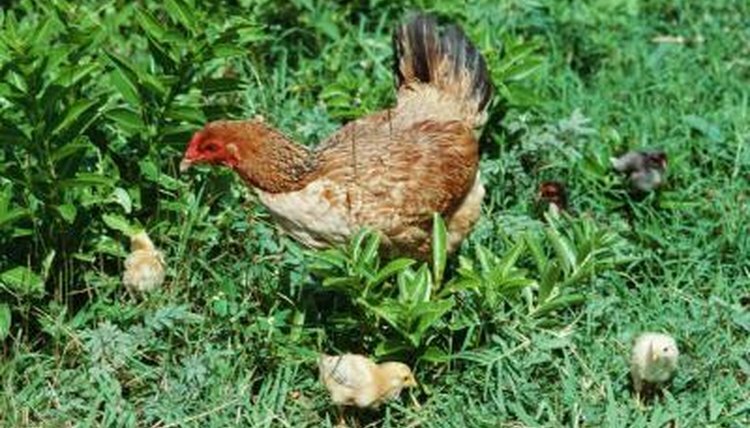 The Americana chicken is sometimes known as an Easter egger because of its distinct contribution to the nesting box -- Americanas lay blue eggs! Technically speaking, there is no true “Americana” breed, as the spelling is a derivation of the americauna breed, itself a reference to a tailless bird known as the araucana. Though origin myths abound, the Ameraucana Breeders Club holds that these official breeds are actually traceable to the various birds we now call americanas or Easter eggers -- chickens that have the blue egg gene. Unless you're raising pure-bred chickens for competition in poultry shows, the Americana/americauna/araucana discussion isn't a big issue -- you just want to add some diversity to your flock, and Americanas do that. An Americana chicken is a lovely creature, with minimal waddles and comb (a peacomb), a feather beard known as a muff and striking feather patterns. Though there's no standard appearance for Easter eggers, they tend to possess small, pigeon-like heads and long, curved necks. Though not an official breed, many chicken keepers report that their Easter eggers are notably friendly birds. It's not uncommon for the owner of an Easter egger to speak of extremely sociable birds who like to vocalize to humans and even rush to be petted or held by keepers -- this friendliness is even reported in Easter egger roosters, an important consideration for those concerned about rooster aggression. Other traits commonly used to describe Easter eggers are hardy, inquisitive and flighty. Of course, physical beauty aside, the main reason people add Easter eggers to their flocks is to get those blue eggs in their nesting boxes. As their name implies, Americanas lay pastel blue eggs that look like the dye-dipped white eggs ubiquitous in early spring -- less the color of a robin's egg than a pale, greenish-blue. Claims have been made, and quickly refuted, that the blue-shelled eggs possess certain health benefits over their white or brown counterparts, but there's no denying these eggs make pretty additions to the egg basket and add an extra level of interest to a farmer's market table.